Fishing is among the most ancient and popular pastimes throughout the world. In this brief but detailed history, Glenn Law examines the development of fly fishing, from the earliest Egyptian copper hooks dating to 2600 B.C. and the first recordings of catch-and-release fishing in China’s Zhou dynasty, to the most modern innovations in tackle and the rise of fly-fishing personalities.Law discusses the landmarks in the tradition of fly fishing, beginning with Dame Juliana Berner’s A Treatyse of Fysshynge wyth an Angle, and Izaak Walton and Charles Cotton’s The Compleat Angler, which stands uncontested as the most-published book in the Western world, with the exception of the Bible. He then traces the English fly-fishing traditions and innovations that flourished or perished in North America, and how this combination of traditions and pragmatism became the sport we enjoy today. 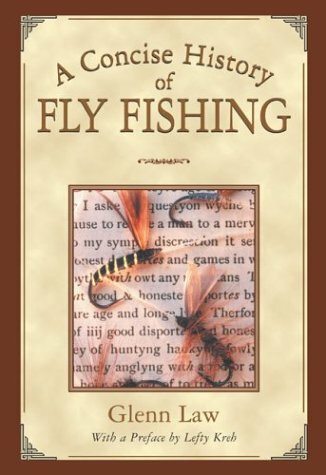 Artfully illustrated with historic woodcuts, etchings, drawings, and paintings, A Concise History of Fly Fishing is a fascinating glimpse at our relationship to fly fishing as it has evolved over the centuries, as a sport, as a way of life, and as a universal pastime of patience and contemplation. I have a very eclectic collection of out-of-print and hard-to-find books. New books are added every week, so be sure to check back often!! I accept payment credit cards (via Abebooks) and PayPal. Returns accepted in a reasonable time with approval. Books must be returned in same condition as shipped. All books are very carefully packed to avoid damage from rough handling and moisture. Free tracking also included. Except in extraordinary circumstances, I do not ask for extra shipping in the U.S.